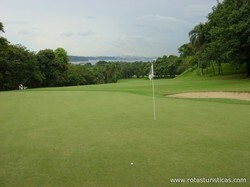 This is one of the three golf courses that are located in São Paulo city. It is set in a club that is sited on the edge of Guarapiranga reservoir, in the south zone of São Paulo, and the fact that it is a short course does not make it any easier. Most of its fairways are quite steep, which requires from golfers a great deal of techniques in order to get good results from their shots. The beauty of the course – especially of the holes that are closest to the reservoir – is impressive. Squirrels and small monkeys frequently witness the game from the tops of the trees. One of the most beautiful holes is the 16th, a par 4 with a dogleg to the right that provides, from the tee box, a great view of São Paulo city and the reservoir; another one is the 18th hole, where golfers take their first shot a few meters from the waters edge. Frequently visited by major businessmen of the city, Clube de Campo de São Paulo is restricted to members and their guests.